The Grange was the first home of the Art Museum of Toronto (later to become the Art Gallery of Ontario) and rests today as a historic Georgian manor in downtown Toronto, Canada. The structure was built in 1817 for D’Arcy Boulton Jr. (1785-1846), a member of the powerful Boulton family. 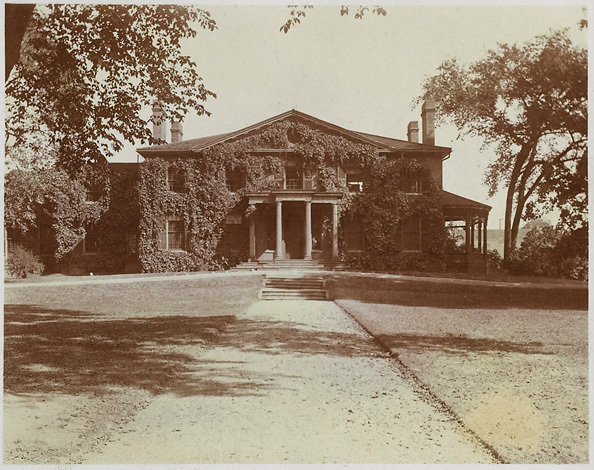 When D’Arcy Boulton’s eldest son and Toronto mayor William Henry Boulton married Harriet Dixon, the house was put in her name in what was known as a marriage settlement. After William’s death she remarried the prominent scholar Goldwin Smith, and the couple lived in The Grange for the rest of their lives. 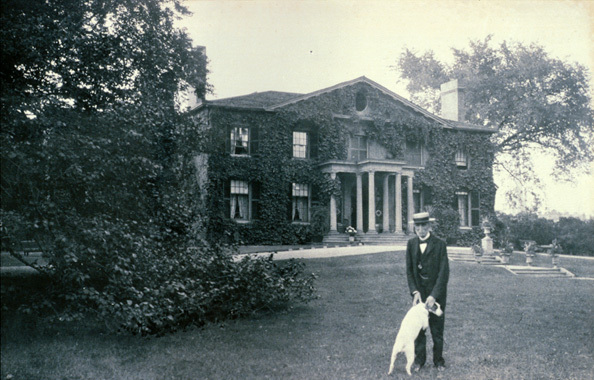 It was Harriet who left The Grange to become the Art Museum of Toronto and after Goldwin Smith’s death in 1910 and Hariette’s death in 1909, the building became the new home of the gallery. Part of The Grange also served as a home of the Ontario College of Art & Design. Use the links to the right to browse this presentation. The Grange was built in 1817 as the home of D’Arcy Boulton Jr., his wife, Sarah Anne, and their eight children. It was located on one hundred acres of land that extended from Queen Street in the south to Bloor Street in the north and from Beverley Street east to McCaul Street. The north section of the property was sold to Bishop Strachan in 1828, to be used for the establishment of King’s College, an Anglican university. Property to the south was donated in the 1840s for St. George the Martyr Church and St. Patrick’s Market (both still in existence). The original house was two storeys high, 60 x 40 feet in area and designed by an unknown architect. It is likely that the bricks were made on the property from the heavily clayed soil. The windows were double-hung with brick lintels and louvered wooden shutters. They are 12-over-12 sash on the main floor and 8-over-8 sash on the second. The front door has a moulded reveal and a semi-circular fanlight, with separate sidelights. Reflecting a sense of Georgian balance, the front door opened onto a central hall with the dining room on the left and the drawing room on the right. At the back of the house and on the second floor, were bedrooms for the family. There were also four large rooms in the attic, probably for the servants. 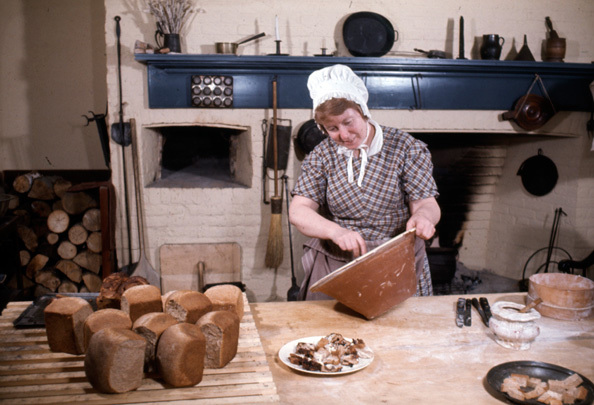 The kitchen, food storage areas and scullery were in the basement. 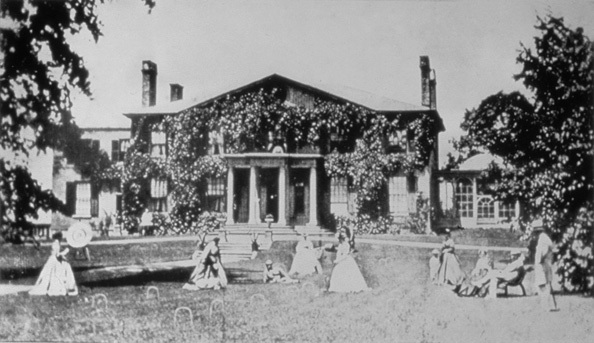 In the 1840s, the Boultons made several additions to the house. These changes included: the enlargement of the drawing room; the elimination of three bedrooms to create a large second-floor assembly room; and an addition on the west end to house an office. William Boulton, who was mayor of Toronto four times and a Member of Parliament, might have needed such a space. He also enlarged the front hall, installed a new central staircase and the painted glass window depicting the family crest. This crest is a visual play on the name Boulton, as it shows a barrel pierced by an arrow, or bolt, with a hogshead of wine or tun. The family motto – Dux vitae ratio or The guide to life is reason, rests below the crest, a reminder to the Boultons of their British ancestry. After Harriet Boulton remarried to her second husband, Goldwin Smith, the couple added a large library to the west of the house and replaced the Georgian style staircase with an angular, Victorian style oak stair. They also replaced the wooden front porch with a stone version. 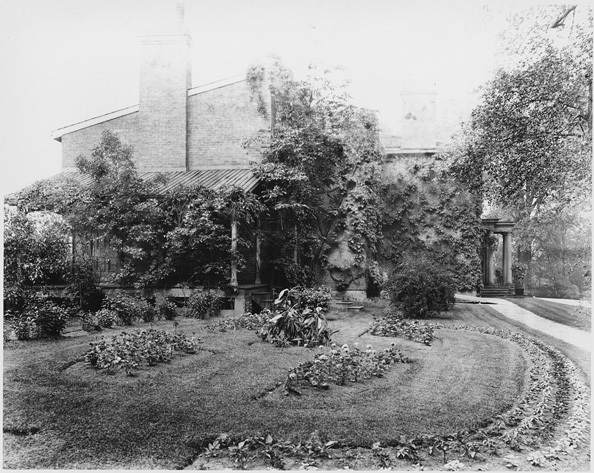 The front lawn of The Grange, now known as The Grange Park, was central to Grange activities. This was the site for many garden parties, church school picnics and even a royal visit. Originally, a path ran up to the front steps, flanked by an oval drive for carriages. The house stood on raised ground with terraces, as it does today. Around it was a mix of open spaces, stands of trees and flower gardens. Behind the house were vegetable and fruit gardens and, farther north, an orchard. Several images of The Grange show a domed glass conservatory on the east side of the house, which would have been filled with plants readily available from catalogues. One 1827 catalogue advertised 79 varieties of apples, ornamental trees, as well as a wide variety of shrubs, flowers and greenhouse plants. We know that there was an orchard house on the property growing peaches, nectarines and grapes. William Boulton won prizes at the 1844 Toronto Horticultural Society Show for geraniums, roses, greenhouse plants and pansies. The gardener, John Gray, named a geranium he developed Pelargonium Boultonianum after the Boultons. With the sale of the southern part of the property in the mid-1800s, a new entrance to The Grange was created, which included a lodge — home to William Chin, the butler, and his family. Other buildings included a stable, a root house, a tool house and a drive shed. Later in the century, cottages for married servants were also erected. The Grange was built by D’Arcy Boulton, Jr. (1785–1846) and his wife, Sarah Anne, (1789–1863) for their family of eight children. D’Arcy trained as a lawyer but worked as a merchant with his brother-in-law, Peter Robinson. Once settled in The Grange he retired and became a land owner. He also had minor government positions. Their eldest surviving son, William (1812–1874), continued to live in the house. He also trained and practised as a lawyer. William was also an alderman, was appointed mayor of Toronto four times and was a member of parliament. In 1846, he married Harriet Dixon (1825–1909), a Bostonian from a wealthy family. They had no children. 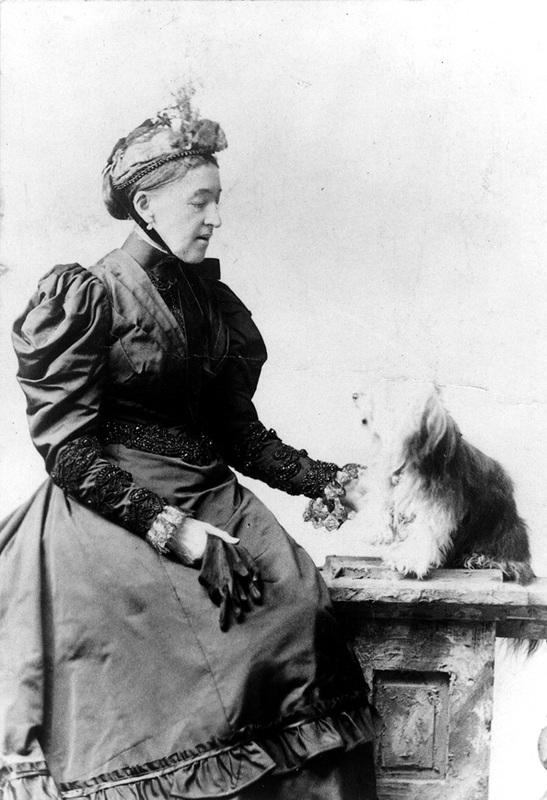 After William’s death, Harriet married scholar and political writer Goldwin Smith (1823–1910). The Grange was also home to a number of servants. While we don’t know much about most of the servants, we do know about William Chin, who was on staff for over fifty years and eventually served as the butler. Because of his long connection with the house and with the family, Chin was interviewed on several occasions by newspapers of the day. By the turn of the century, it was decided that Toronto should have an art gallery, much like many other major cities at the time (The Metropolitan Museum of Art in New York, The Museum of Fine Arts in Boston etc). By 1900, local artist George Reid was the president of the Ontario Society of Artists and was pushing for the creation of an art gallery. Between Reid and Edmund Walker (prominent banker and champion of the arts), a campaign was established to raise money for the gallery scheme. In 1902, the Smiths joined the cause and decided to bequeath The Grange as the first location of the Art Museum of Toronto. It wasn’t until 1913 that the museum held its first exhibition, composed of Smith’s own collection. By 1966, The Art Museum of Toronto was renamed the Art Gallery of Ontario. The Grange underwent a variety of changes between the early days of the Art Museum of Toronto and the restoration project in the 1970s. These included the electrification of the building and the construction of an apartment for a live-in caretaker. In 1918 and 1926 respectively, additional gallery wings were added to the AGO and staff used several rooms in The Grange as offices. The Grange also enjoyed a tea room in the drawing room and breakfast parlour. 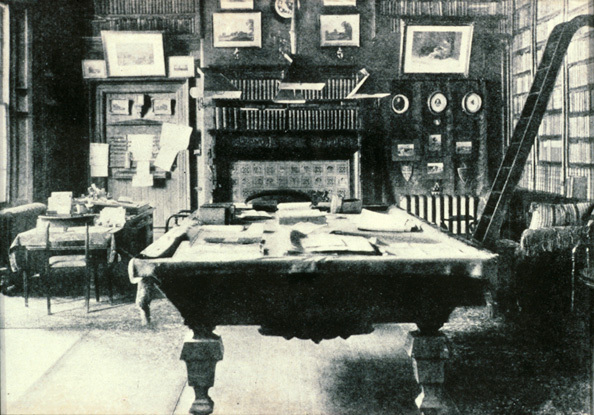 Goldwin Smith’s library housed the AGO library. By the early 1970s a new path was forged for The Grange with additional expansions to the AGO. At this time in Ontario, an increased interest in heritage preservation encouraged the AGO’s Junior Women’s Committee to raise funds for a feasibility study. Realizing that The Grange could be restored as an historic house museum, the Committee eventually raised over $500,000. This money was used to restore The Grange to the period of 1835, including historic furnishings. In 1970, The Grange was named a National Historic Site of Canada. For more information on the restoration, click here. 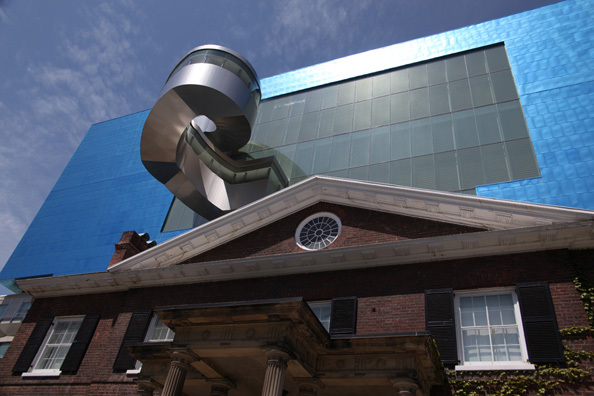 Today, The Grange is a vibrant part of the Art Gallery of Ontario and its programming. It houses the Norma Ridley Members’ Lounge and exhibition spaces. While it no longer functions as a historic house depicting the 1830s, it retains its historic roots and architectural integrity. Visitors to the AGO are free to enjoy The Grange and explore the exhibits, or simply enjoy the beauty of the house.